Our vehicle tracking app is a brand new addition to our existing Real-Time Vehicle Tracking system. If you don't yet use our van tracking feature, check out the webinar to learn more. Please bear in mind that this feature is only available on our Paperless Office plan and above. If you're not on this plan, book a meeting or call the team on 0203 0266 266 about upgrading today. Field service business owners and managers are regularly on the road, whether going to jobs, visiting company branches, or meeting clients and partners. But being away from the office shouldn't mean being out of touch with your team. Commusoft keeps you up to date with everything. 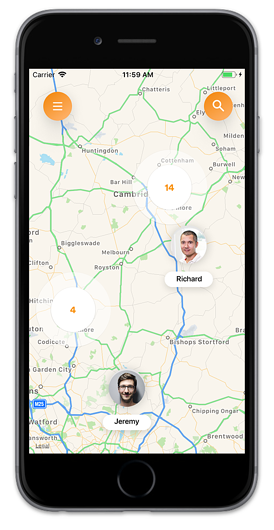 Now with our tracker app you can see the real-time and historic locations of all of your vehicles. (Did you know you already can view and manage multiple engineers' diaries from your smartphone too?). Forget wasting time calling into the office to ask for an update on the schedule and everybody's whereabouts - you have everything you need right in your phone (or tablet!). 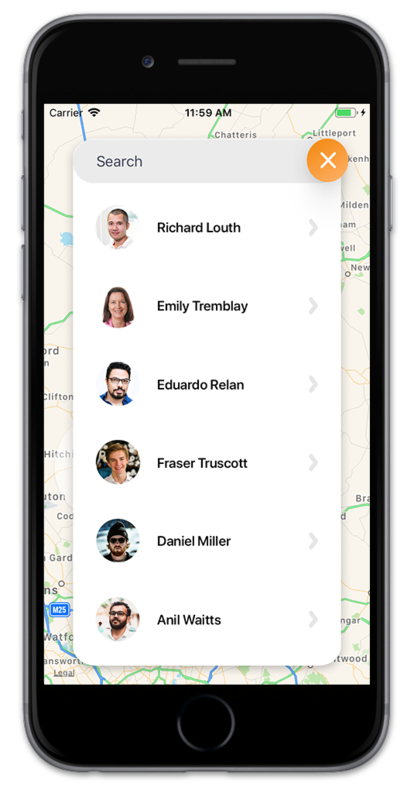 Simply open up the Commusoft - Vehicle Tracking app to browse your engineers' locations. Zoom out and you'll see the total number of engineers in different areas, or zoom in to see each individual's location. Check out both the Android and iOS versions of the tracker app below. Once you select a user, you'll be taken to their real-time location on the map - if that's not available, you'll see their last known location. We have a couple ways to display whether an engineer's location is up to date. Firstly, when viewing a user's profile (by tapping their icon) you will see the date and time that they were last seen. On iPhone: You'll also see a clock icon on the user's image, meaning the tracker hasn't sent information for a while. - If the icon is orange it means the tracker is idle - it hasn't transmitted data for more than 20 minutes, but less than 1 hour. updated over 1 hour ago. The tracker is offline. On Android: Instead of a clock icon you'll see whether the tracker is online, offline, or idle from the user's profile. - Idle means data hasn't been transmitted for more than 20 minutes, but less than 1 hour. - Offline means data hasn't been received from the tracker for over 1 hour. From an engineer's profile you don't just get access to their real-time location, but also their historical trip data. This means you can monitor a vehicle's whereabouts earlier that day or even up to a month prior, giving you oversight of your company property at all times. Swipe up to open the list of trips from the past month (you can also tap the orange icon on iOS devices). 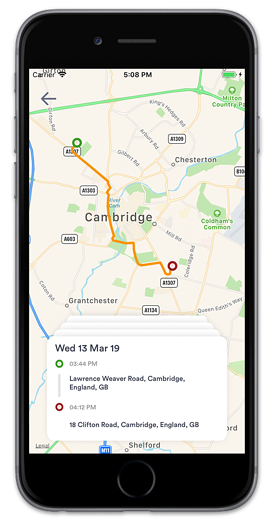 It works very similarly to the driver trip report on the web version - you'll see the time and address for both the start and end of the trip, and can tap on a trip to see the route taken on the map. On iOS you can then just swipe through the cards at the bottom to change the view to the next trip. 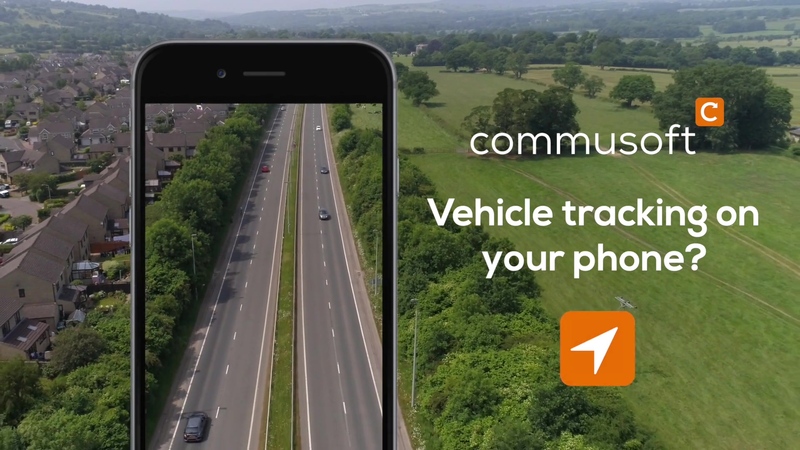 Next, you'll need to download the Commusoft - Vehicle Tracking app to your phone or tablet from either the Google Play Store or the Apple App Store. If you struggle to find the app via the search, either use the links above or go to the Commusoft Ltd developer page - unfortunately, as the app is new it can take some time to appear in search results. Finally, log in with your Commusoft ID, username, and password. Note, you'll need to be an Office Staff user role or above in order to view tracking information. Not yet using Commusoft vehicle tracking? 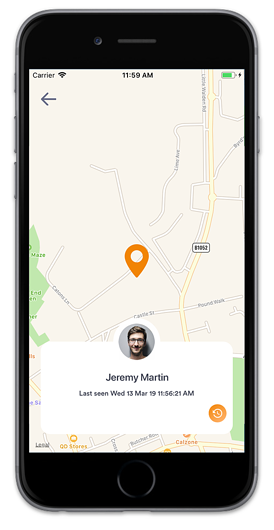 Commusoft's Real-Time Vehicle Tracking solution allows field service businesses to see the live location of vans directly from their job management software - and now from the vehicle tracking app too! You can also access much more, with driver trip history, safe driving data, and the engineer profile portal. This links engineer tracking data with your diary, scheduling tools, and job records for an all-in-one solution. We've put together a Real-Time Vehicle Tracking brochure with info on the features, trackers, and pricing. If you're interested in implementing vehicle tracking software and want to learn more about all the benefits and what it looks like in practice - check out our webinar, where Jack covers everything. 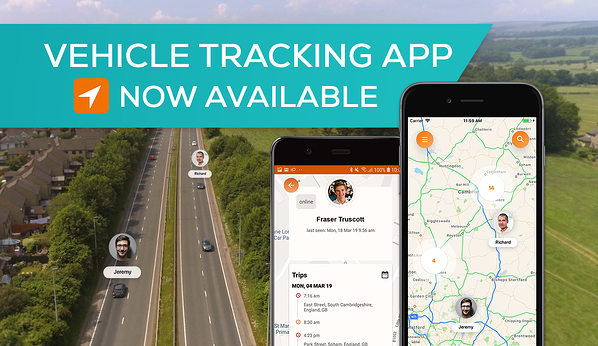 Love our new tracking app? We'd love to hear your thoughts. You can do so from the app store or via software review site, Capterra.